This delicious Lamb and Rice hypoallergenic dog food is certain to go down a treat! 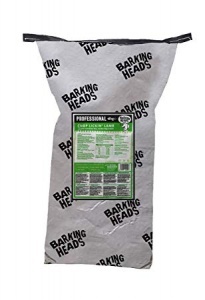 Barking Heads Chop Lickin Lamb is packed with a minimum 52% lamb fresh and dried combined. With its skin and coat conditioning properties and added specific oils this product is sure to improve even the best of coats. Lamb is an excellent source of protein which promotes a glossy coat and healthy skin, plus it helps to look after your dog’s hips and joints. The only things in the bag are delicious nutritious ingredients and lots of them! Chop Lickin Lamb is wheat and Barley Free which helps to prevent allergies (and associated scratching). Optimal levels of Omega 3 and 6 prevent itching and excess shedding. Glucosamine and Chondroitin nourish and repair cartilage in joints.Contains only UK-sourced ingredients that are all-natural and wonderfully nutritious, with NO flavourings, colourings, preservatives or GM ingredients.